Stay hydrated throughout your mission with CamelBak's Mil Spec Antidote Reservoir. 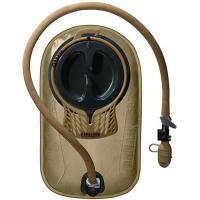 This safely holds 50 ounces (1.5 liters) of liquid for you to quickly access using the bite valve adapter. You won't waste a drop thanks to the auto shut-off valve and can control the water flow directly on the drink tube with one hand. It's made of BPA- and BPS-free thermoplastic polyurethane and comes with a 42-inch insulated tube. The reservoir measures 11.5 x 7 x 1 in when empty and, when filed to capacity, is only 11 x 6 x 2.5 in. It's light-weight (weighing only 8 oz. when empty) and is designed to have the lowest profile possible to reduce reservoir stack and maximize stability. The Quick Link system and QL HydroLock drink tube also allows you to attach CPC accessories (e.g. USMC standard filter). PLEASE NOTE: The actual product is BLACK. The image above has been lit to show detail and does not reflect the actual color. CamelBak products come with a lifetime guarantee. Quick Link Exit Port and QL HydroLock Bite Valve Adapter: tube clicks off for faster refilling with auto shut-off. New Fillport: Industry's largest opening with air-light 1/4 turn open/close for quick, secure seal that can't be over-tightened. QL HydroLock offers easy, one-handed on/off water flow on drink tube. Quick Link and QL HydroLock drink tube: Quickly and easily attach any CPC accessory. Insulated drink tube cover protects tube from harmful UV rays and abrasion. CamelBak's Got Your Bak Guarantee. If we built it, we'll Bak it with our lifetime guarantee.